C reating a mental design for your home is one thing—actually designing it is another thing completely! Decorating your home the way you’ve always wanted can be exciting and stressful at the same time. There are many things you need to take into consideration during the process of design. The easiest way to get everything accomplished is to hire an interior designer. When you’re looking for interior designers in Alpharetta, there are several things you need to consider. It’s easy to get carried away in the excitement of designing your home. There are so many new and luxurious things that you could install in your home, but all of them come with a price. When you plan to redesign your home, it’s important that you create a strict budget for yourself. You need to come up with a budget for the amount you would like to spend on furniture, carpet, paint, and any other design components that you plan to use. You also need to set a budget for how much you want to pay your interior designer. If you need your home to be redesigned by a specific date, that’s important information to tell your interior designer. You want to figure out a timeline before hiring anyone. Get out a piece of paper and write down a list of things you would expect from your interior designer. If you aren’t clear about what you expect when you first meet an interior designer, one of you will probably be let down. Redesigning a home can create a hectic environment for children and pets. Before the interior designer begins to remodel your home, it’s crucial that you figure out what you will do with your pets. It isn’t always safe to leave your animals roaming around your home when interior design work is being done. 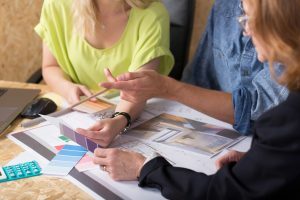 If you and your spouse live in the home together, you need to figure out which person will be making the final decisions and reporting them back to the interior designer. Your interior designer can get very confused if you and your spouse are telling them to do different things to the home. Is the interior design work going to be so extensive that you need another place to stay during the process? If your bedroom is being completely gutted and redone, you might want to consider getting a hotel room or staying with a family member.